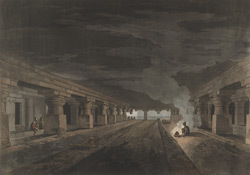 Plate 24 of 'Hindoo Excavations in the Mountain of Ellora near Aurangabad,' engraved by Thomas Daniell after the drawings of his deceased friend James Wales, which Daniell regarded as the sixth set of his 'Oriental Scenery.' This single-storey excavation is in the southernmost group of the Buddhist caves, and dates back to the 6th Century. It consists of a long spacious hall or vihara which was used as a Buddhist monastery as it is indicated by the residential cells cut into the side walls which can be seen in this print. The two long lines of benches carved out of the floor were probably intended for the use of the monks when studying or dining. The hall is divided into three aisles by two rows of columns. Daniell has carefully depicted the 'sheet of water, that, in a beautiful cascade, covers the front of the excavation as with a curtain of crystal' in the rainy season.